YOU know that climactic moment in Strictly Ballroom – the one where National Australian Federation of Dance president Barry Fife has the plug pulled at the Pan Pacifics on Scott and Fran’s music and their illegal steps, and then there’s the sound of one person clapping to get the rhythm going? And then everyone starts clapping, and Scott and Fran soar? Of course you do. As does the audience for Strictly Ballroom the Musical. According to the script of both film and musical, downtrodden Doug Hastings, Scott’s father and a closet dancesport renegade, finally asserts himself and supports his son’s rebellion against the petty tyranny of the competitive ballroom dancing hierarchy. At Friday night’s final preview the audience joined in after only two handclaps from Drew Forsythe’s Doug; at Saturday’s opening of Baz Luhrmann’s crowd-pleasing but deeply uneven extravaganza they didn’t even wait for that. Uncued, except by their familiarity with the film, 2000 people put their hands together. Thunderously. Audience and show had became one. In this respect Luhrmann’s translation of his justly loved 1992 film to the stage is a success. (More precisely this is a return to the stage, as the piece was born in 1984 as a theatrical work.) 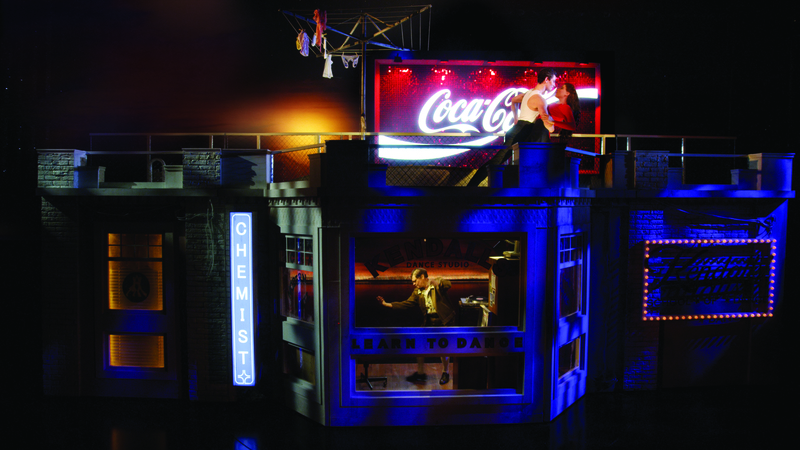 Luhrmann gives people what they expect and want, which is essentially the film’s structure, imagery, dialogue and songs with added musical numbers. There is, however, a considerable downside to this trip down memory lane. The bracing grotesquerie of the film too frequently hardens here into shrill cartooning and the new music, from a variety of hands, is mostly inconsequential at best, banal at worst and inconsistently applied. Why does Shirley Hastings sing while she’s putting a Band-Aid on Fran’s knee? Search me. The balance is out of whack, giving Strictly Ballroom the Musical a loose feel when it should be as taut as the buns of steel so liberally on display. Let’s put it this way. By the time we’ve reached interval the show is already as long as the film is in its entirety. Along the way the show’s original impulses are trampled on. The themes of being true to oneself, resisting heavy-handed authority and seeing beyond the superficial to what is truly valuable struggle to compete with the noise. Exhibit A is the scene at Fran’s modest suburban home in which Scott learns what the paso doble really is. It starts so well as the absolutely splendid Natalie Gamsu and Fernando Mira as Fran’s grandmother and father embody an earthy vigour that shows up the empty glitz of the ballroom world. And then one realises with mounting horror that the Habanera from Bizet’s Carmen has been co-opted for an instant dash of Spain, given a soupy arrangement and, when one could hear a phrase or two escape from the murk, lyrics that are puerile and redundant. Presumably this seemed a fabulous idea at the time but it sure doesn’t feel like it now. This is surprising because, like it or not, Luhrmann’s is an art of sensation and instinct rather than intellect. Catherine Martin’s designs are absolutely crucial in this, and here she revels in sets that advance, retreat and circle and delivers costumes in eye-poppingly artificial liquorice allsorts colours. The lithe, leggy ladies of the indefatigable ensemble are dressed either in clouds of tulle or in scarcely enough sequins to cover a pincushion; gents are encased in iridescent onesies with the snug fit of condoms. Divine. In a nod to Luhrmann’s description of this style of theatre, there are red curtains within red curtains. It takes experience to prevail over such sense-saturation. Wonderful Heather Mitchell heroically finds some nuance in Scott’s termagant mum Shirley and Robert Grubb’s tyrant Barry Fife is highly enjoyable. Andrew Cook as Scott’s friend Wayne is a standout in the younger set. The honey-voiced Phoebe Panaretos is just lovely as Fran and will be lovelier if she drops the early daggy-girl schtick. Thomas Lacey has the show’s most difficult assignment in playing Scott and is at present a little under-equipped. He fields a light voice, a sweet personality and slightly reticent dance demeanour but may well blossom when more battle-hardened. His Act I dance number (choreography by John O’Connell) doesn’t thrill as it should and nor does the finale for Scott and Fran. 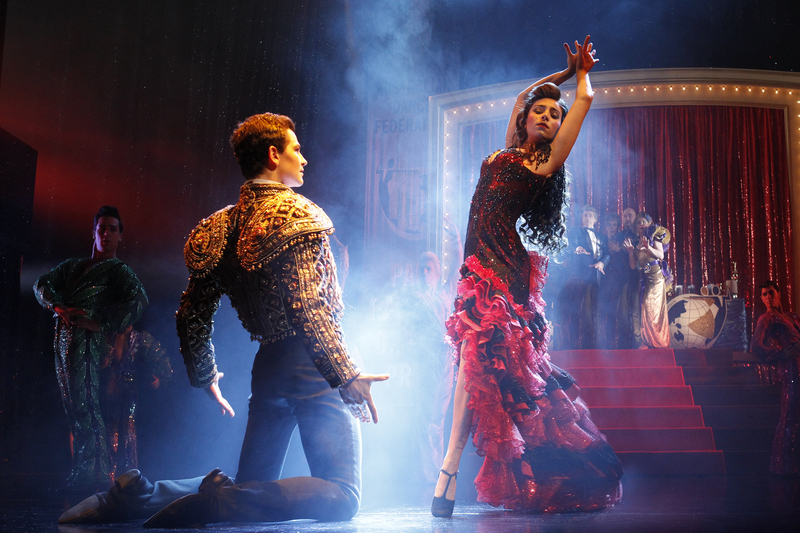 Scott’s Act I dance is a good example of the way in which Strictly Ballroom the Musical falters in the transition to the musical theatre form. This solo’s function is to convey the depth of the young man’s frustrations and ambitions. Choreographically it is uninteresting, with an over-reliance on barrel turns, but it is also staged in a perfunctory and frankly second-hand manner. Screens are wheeled in that at first obscure Scott, not necessarily the greatest idea. But wait, they are mirrors in which we are surely to see Scott multiplied and exalted. That idea is well known from The Music and the Mirror from A Chorus Line, which is Cassie’s expression of her frustrations and ambitions, but here the mirrors hardly have a chance to register before they are gone. Bewildering. There are other examples of sketchy or lumpy shaping that would suggest nowhere near enough time has been spent on the show’s construction. The erratic use of the music – and its quality – also suggests that. A reading of the fine print at the back of the program reveals Lurhmann getting credits as composer and lyricist as well as co-writer and director. Who knew he also wrote music? Alarm bells ring at the thought of so many hats on the one head. Who is there to tell Luhrmann that lyrics he co-authored, such as those for When You’re Strictly Ballroom (to Strauss’s Blue Danube) and A Life Lived in Fear (to Bizet), or the music he co-wrote are far from being top drawer? Not surprisingly I was somewhat reminded of King Kong, also produced by Global Creatures. It too featured a variable mash-up score and an uncertain structure. Despite CEO Carmen Pavlovic stoutly saying the producers were happy with it and there would be few changes, I understand King Kong is being significantly reworked. Certainly the postponement of its announced November Broadway opening would seem to back up what one hears. But even if people do know the film intimately, it is now more than 20 years old and being presented in a medium that has its own special attributes and needs. Luhrmann hasn’t taken the imaginative leaps one might have expected from him. He has made safe, predictable choices. A version of this review appeared in The Australian on April 14. This entry was posted in Musical theatre and tagged Andrew Cook, Baz Luhrmann, Carmen Pavlovic, Catherine Martin, Drew Forsythe, Fernando Mira, Heather Mitchell, James L. Nederlander, John O’Connell, Natalie Gamsu, Phoebe Panaretos, Robert Grubb, Thomas Lacey by deborahjones2012. Bookmark the permalink.